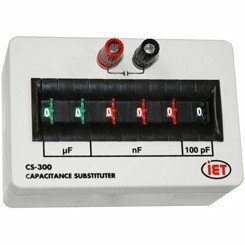 IET Labs CS-300 CS Series Capacitance Substituter Economical, indispensable tools for a variety of uses in engineering, design, troubleshooting, or service. These small, rugged substituters can satisfy most requirements. The CS-300 Capacitance Decade Box is the most commonly used capacitance decade box on the market today. The CS Series is not only easier to use, but it is also priced lower than most its competition. The CS-300 is an economical, indispensable set of capacitors with a variety of uses in engineering, design, troubleshooting, or service fields. One nice feature of the CS Series is that it uses convenient side by side, color coded, thumbwheel switches allowing for direct reading - There is no fumbling with multiple slide or rotary switches. Simply dial in the desired values and use! Made of high impact plastic and weighing less than a pound, these capacitance decade boxes are very portable and can reduce clutter on a busy lab bench.